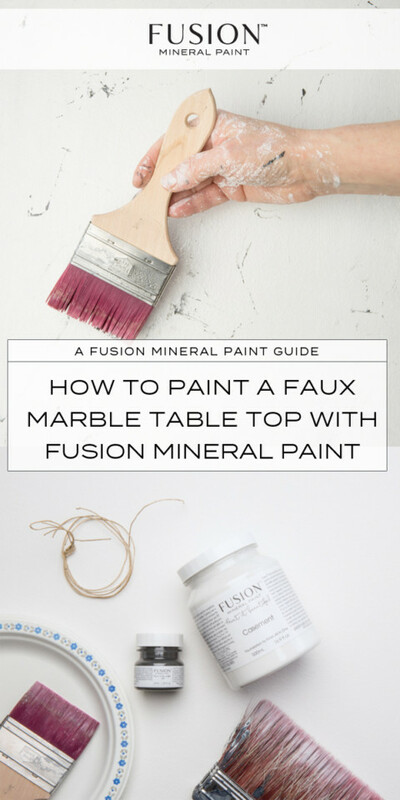 How to paint a faux marble table top! 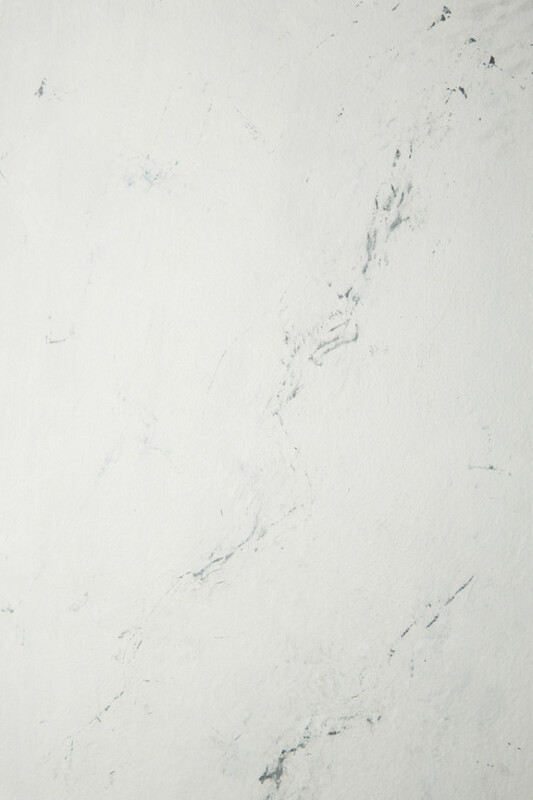 If there is one style that has stood the test of time it’s definitely marble. From kitchen back splashes to cell phone covers, marble and the various variations and colors in it’s pattern, is absolutely everywhere. People cannot get enough of it. The one caveat is that marble can be very expensive and not in everyone’s budget. 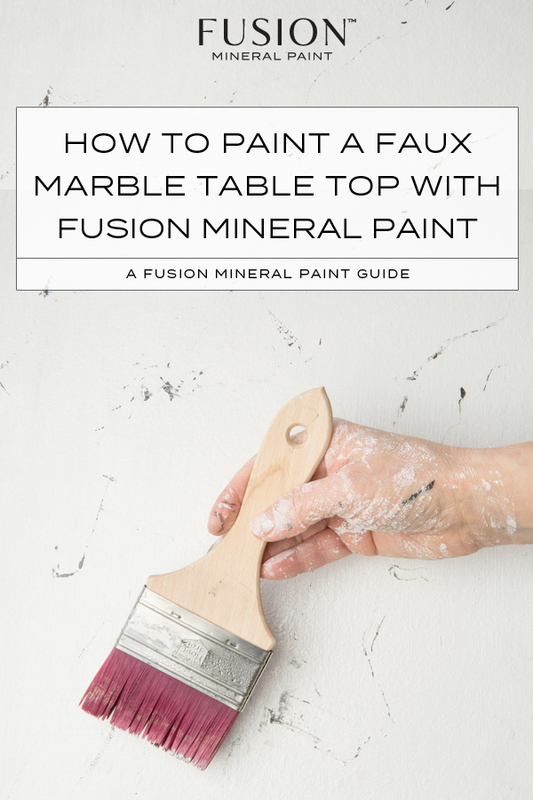 So we came up with a great DIY – painting a Faux Marble Table Top with Fusion Mineral Paint! 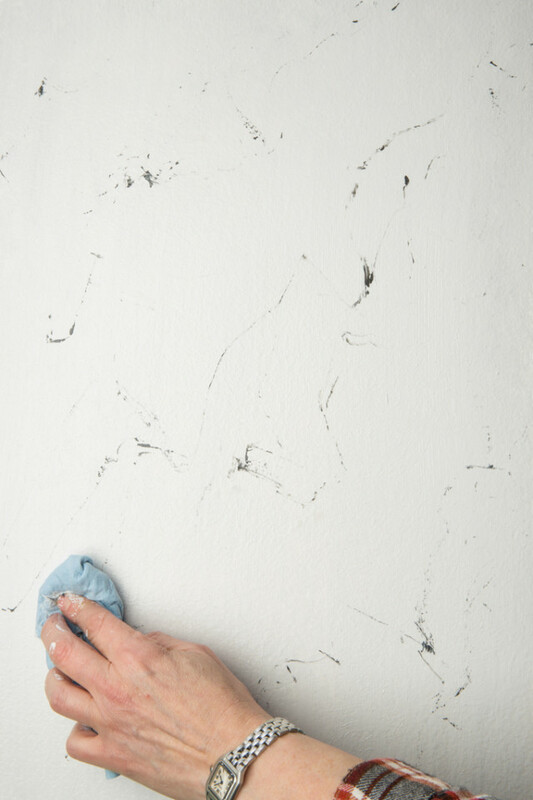 A fun way to get the look of marble, without the high price tag. 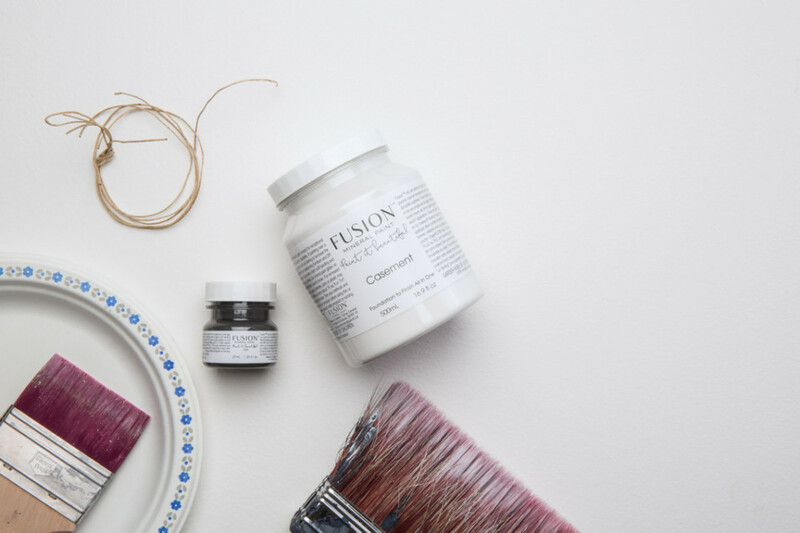 Make sure to clean and PREP your table top surface properly before painting it (read our blog post on how to prep right here) with Fusion Mineral Paint in Casement, which is a very crisp, pure white. 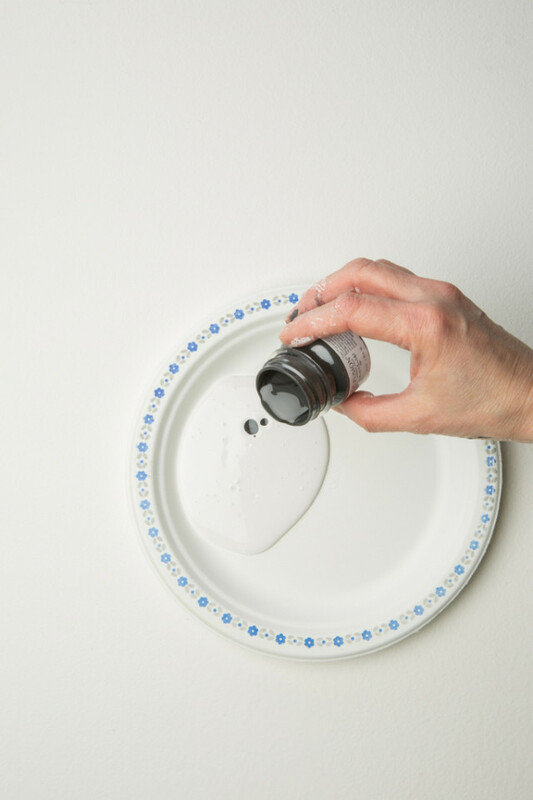 On a separate surface pour some Fusion in Casement and then add a couple of drops of Ash. This will get you a really lovely blend of grey and white. 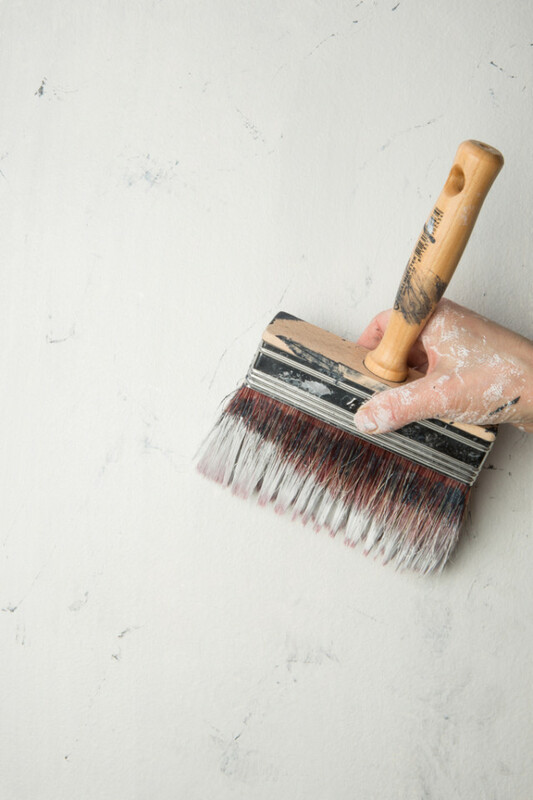 Using a wall brush, blend the two colors together but don’t over blend. Just a touch of mixing the colors. 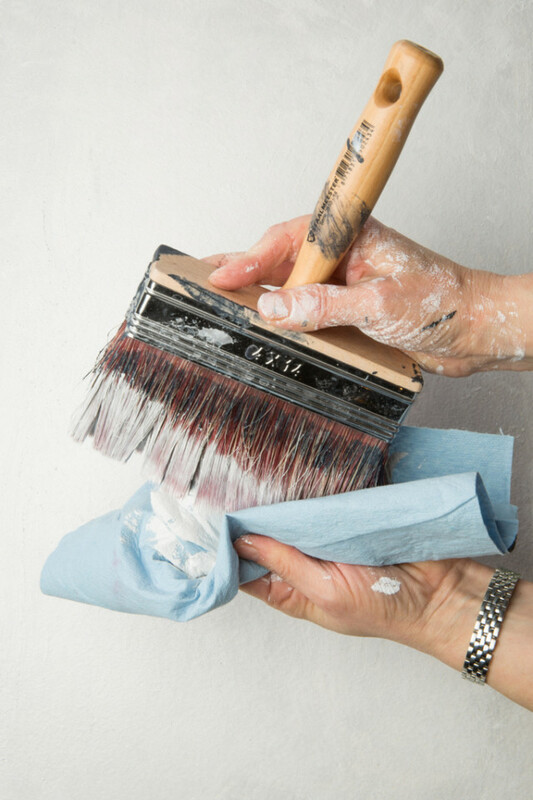 Gently remove any excess paint with a paper towel or microfibre cloth. As our Loree Pringle says be “really willy nilly” when you brush the color blend across the surface. 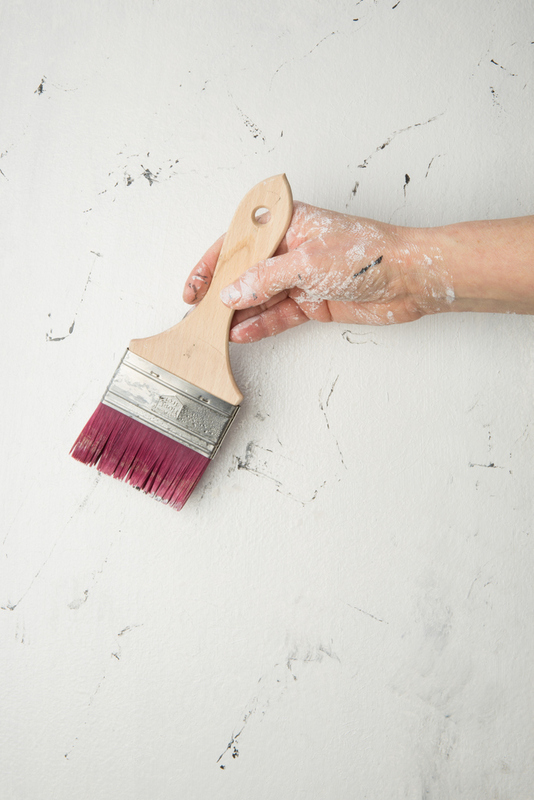 Basically, run your brush lightly over your base coat of Casement. 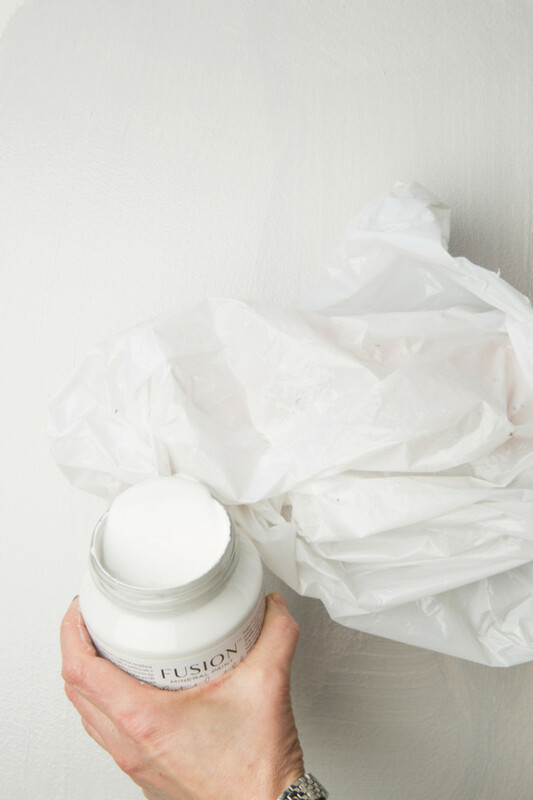 Using a plastic grocery bag (re-use your grocery bags and help the environment! ), add a little Casement to the outside of the bag. Then with your hand inside the bag, blob it onto the surface like a makeshift paint brush. Alternate this with Step 3, going between the two to create a marble-y pattern. 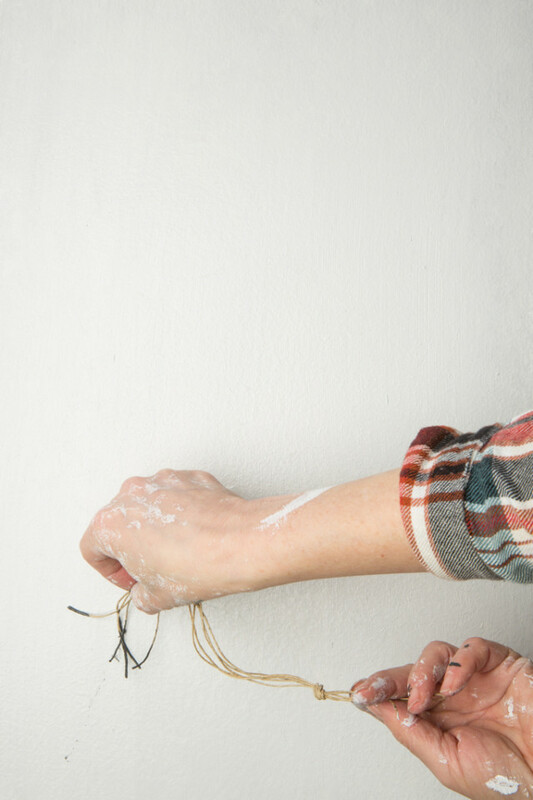 To create your marble lines, dip some string (or a feather if you prefer) into Ash and then use a paper towel to offload the excess paint. Then drag your string lightly across the surface. Think of it as a pattern of a mountain cracking – it’s an easy way to determine where to put the “marble veins”. 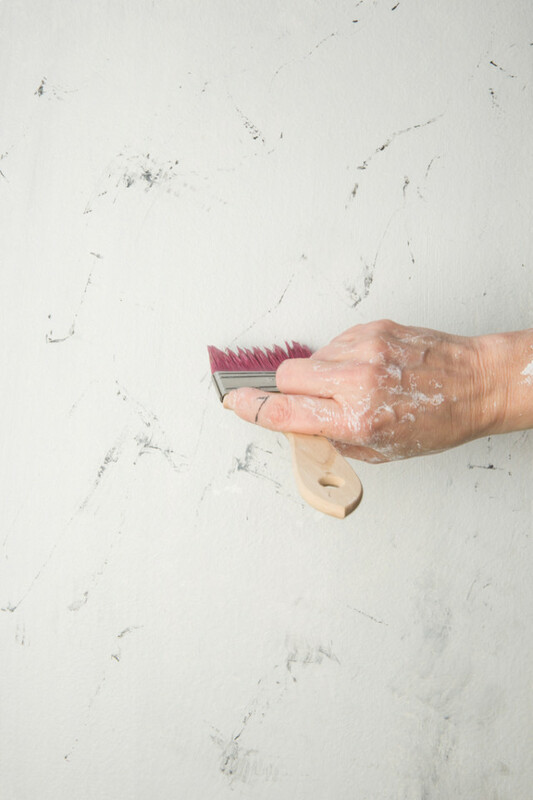 Using a combination of both a brush, rag and our grocery bag, you then are able to soften the look of the faux marble veins. 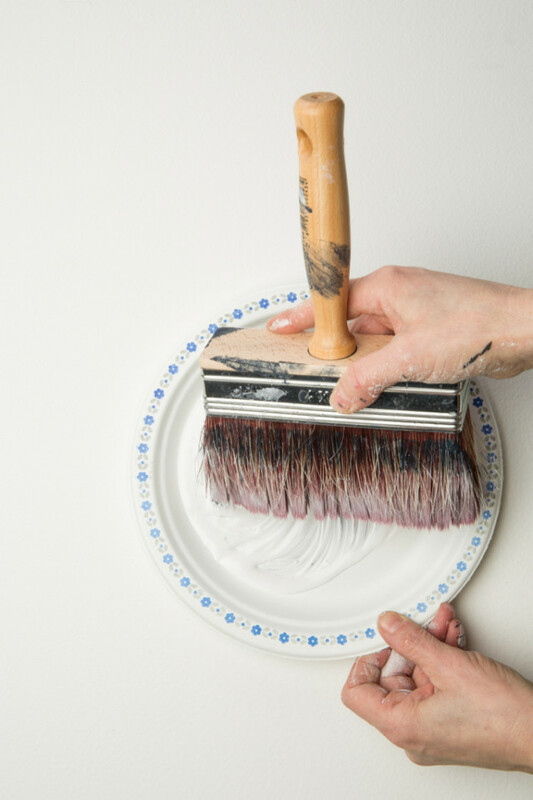 First, using our Staalmeester Flat Ulimate ONE #10 synthetic brush, spray the brush with some water to make it just a little damp. Then lightly swipe over the marble veins. 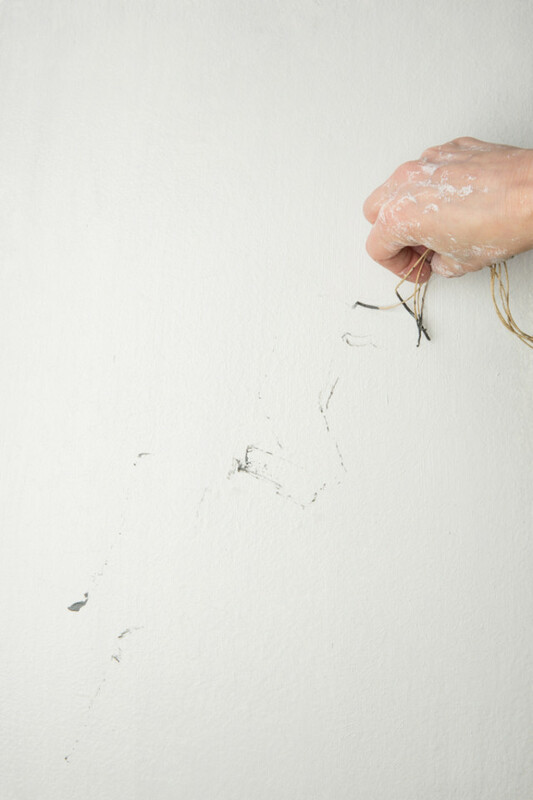 Afterwards use a rag to take off the excess paint by lightly dabbing the veins. 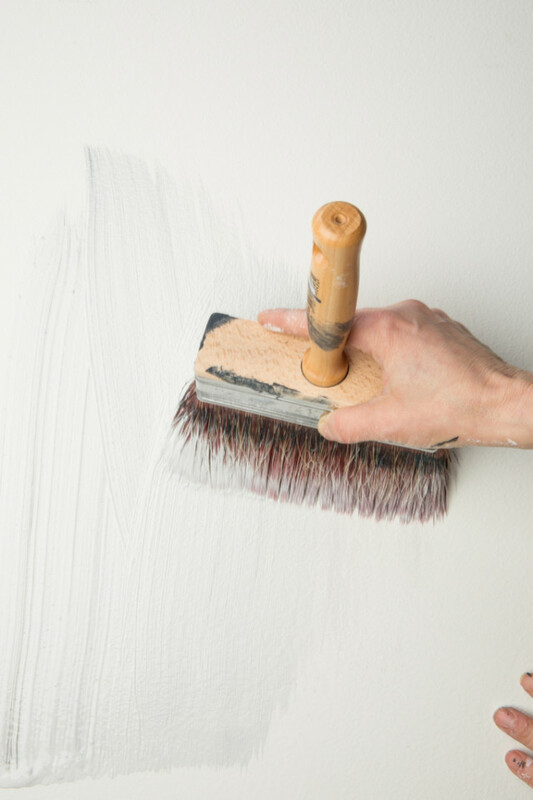 Then remove excess paint from the brush and repeat. Going back to the grocery bag, add some more paint to it and repeat the process you did in Step 4. What the bag does is add some texture to your pattern. Finally, using a dry brush, sweep back and forth to soften any harsh edges. Then step back and re-asses your table top. Does it have enough veins and texture? Are you happy with the pattern? Loree decided to add some more veining to ours to really emphasize the marble look. 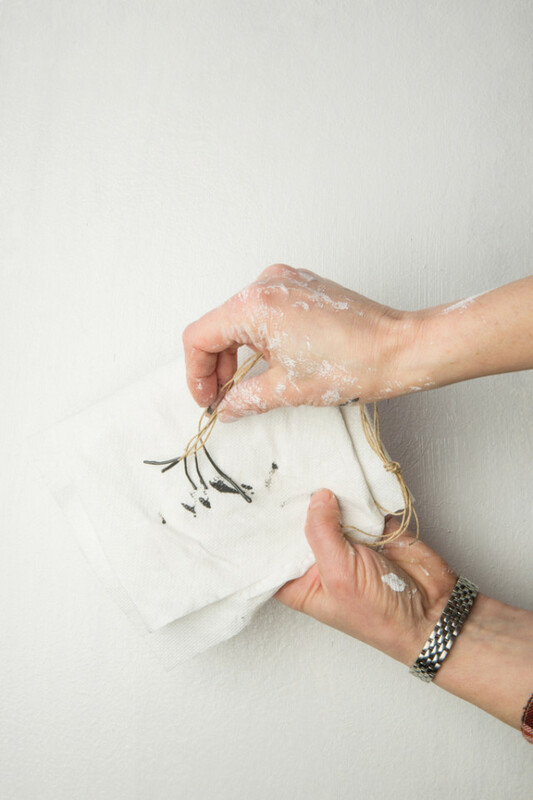 TIPS: If you feel like there is too much paint on the surface, blot it with a rag – this means going straight down and straight up with rag/paper towel. Do not go in circles, you don’t want to smear it around. 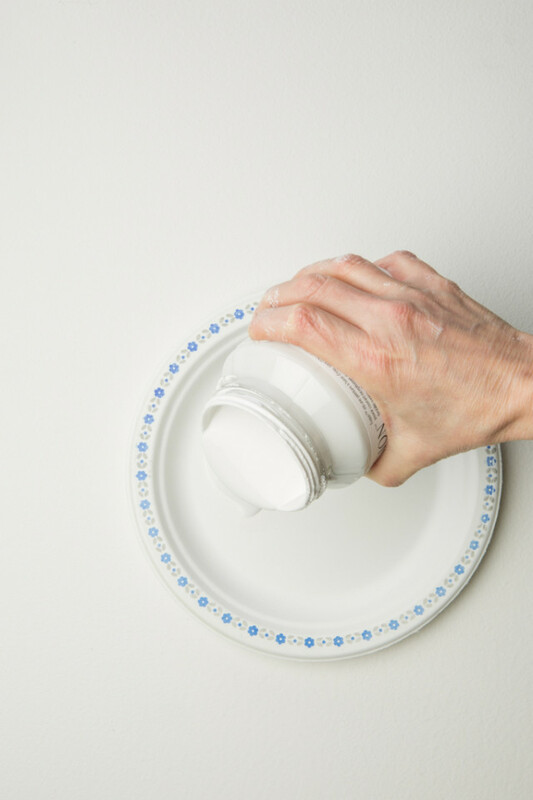 If you are doing this on your counter top, add our Tough Coat for an extra layer of protection as it is a high traffic surface. 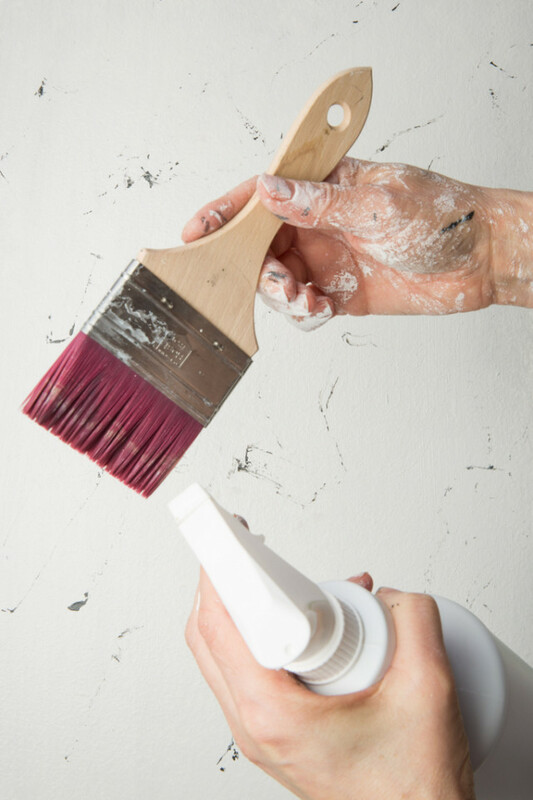 If it’s a dresser or a table top that doesn’t get of regular use, no top coat is needed. Making your own faux marble table top is an abstract art type of process that takes trial and error as it’s really dependent on how you’d like the marble veins to look. The good news is you can always paint over if you make a mistake. If for whatever reason you feel frustrated that it just isn’t looking right – take a break! Fresh eyes sometimes show you more beauty, especially if you’ve been staring at a pattern for some time. 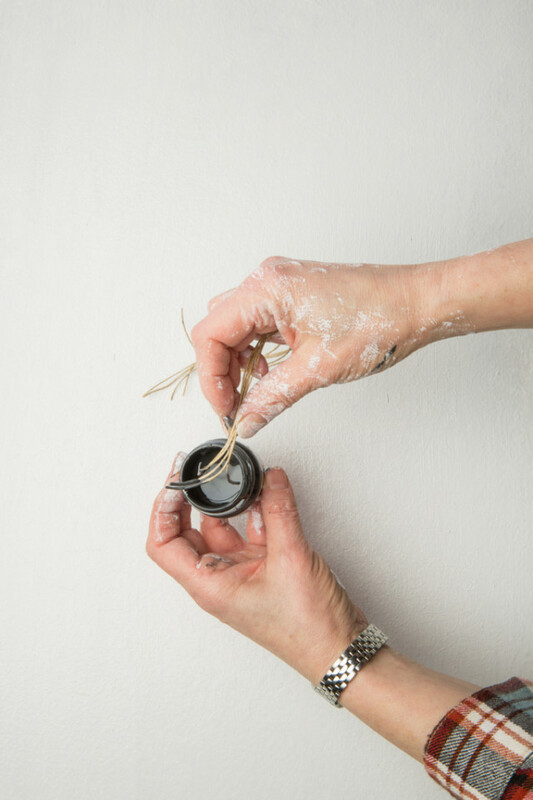 We always suggest having as much fun as you can with any paint project because the sky is the limit when it comes to creating with Fusion.